Always on a run, never ending feeling of forgetting something important, not having enough time to do everything planned, feeling guilty for not spending enough time with your family and friends or struggling with squeezing in your beloved swimming workout. Does that pretty much sum up your everyday life routine? Well, don't worry you are not the only one who suffers from lack of hours in a day and the failure to successfully debug the sophisticated work/life balance algorithm. So, how do you workout when all you do is work and finding time to swim is an impossible feat. Our biological human nature makes us strive to be the best at what we do and always improve upon our existing skills, so there is no wonder the work/life balance is out of whack for the most of us. Unfortunately, we need at least some money to survive, so the work we do is a big part of our daily lives and it consumes us so much that finding the precious time to do something else such as our favorite sport, swimming :), is very difficult. Or is it really that hard to say no to never ending piles of work? It definitely is not easy, but this article is not about how to manage your work, instead, I'll show you how to exercise during the time you are idle. As swimmers, we try to optimize our day, so we handle all the necessary work and then still have more free time to get our morning, lunch or evening swimming workout in. This sounds great in theory, however, unless you have mastered the New Rich phenomenon, the reality is that it takes a lot of dedication and discipline to optimize your day properly, so you can enjoy your daily swims without stress. Many folks who work in bigger cities (not so lucky to work remotely or to have changing facilities at work to wash up after a sweaty bike ride) spend at least 1 hour a day enroute in some sort of public transportation (or a car) to and from their job place. This 1 hour a day translates into 5 hours a week which is a plentiful amount of time for some form of physical activity. I'd replace the stressful commute for a healthy swim workout any day. 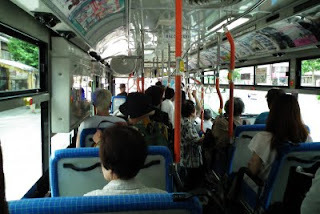 This being a swimming blog, I'll give you some tips on how you can improve your swimming while out of the water in your favorite public transportation vehicle (be it a bus, tram, train or metro) or even a car. As discussed on many occassions, the muscle strength in your core body is one of the key elements in faster and easier swimming experience. The stronger the core, the more power you can generate from your hip rotation and the straighter you will swim eliminating the necessary drag. One way to get a better core is to challenge yourself with miscellaneous stability exercises such as standing on one foot, standing on a balance board, sitting on a stability ball, doing push ups with your feet on stability ball, performing hand stands with shifting weight from one hand to another, utilizing bouncing medicine balls, fighting the TRX suspension belts etc. etc., the list is endless. You can let your imagination run wild in coming up with new exercises which work on your stability, but remember to always do the exercise in a controlled manner with a good body posture, otherwise it looses the meaning. To strengthen your core, you do not have to perform all the workouts in a gym with sophisticated balance muscle strengthening equipment. Why not engage your body in a short workout on your way to or from work in the dreaded public transport. Do you think I am crazy? Maybe :), but it is totally feasible to fit a workout in. I am not talking about sweat drenching, heart pulsating workout, but a seemless series of small core strengthening exercises. Nobody will even know you are exercising, so you don't have to worry about the entire bus looking at you as if you just came from a different planet. Next time you are in your favorite public transport, how about you do not sit down on your way to work (let the older people sit) and rotate standing on one foot for 1 minute at a time. To make it a less obvious to the bystanders keep the floating foot only a few inches (centimeters) of the floor while holding your body nice and straight (as if you were standing on both feet). I guarantee you that all the turns the public vehicle will make on your way to work will test your balance nicely and nobdy will even notice. In a same way, you can work on your shoulder strength by hodling onto something while standing on one foot and only using your shoulder to keep your body nice and straight and stable. 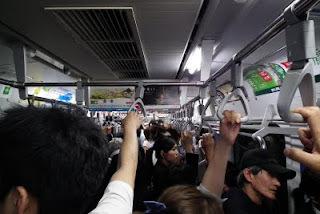 While we are on the shoulder muscle topic, how about if you hold onto the vertical bar which is almost in all public transport vehicles, so you have a ninety degree angle in your elbow and your elbow is at the side of your body. Now push with your palm against the bar and keep the pressure constant for 30 seconds. Then switch to the other hand. Voila, you just have 3 exercise repetition routine for your way to work and nobody in the bus even knows they are witnesses to a very important swimming dryland workout which will help you keep your body aligned properly in the water. How about on your way home? Don't dispair, stand on your tipy toes to strengthen your calf muscles. Keep this position for 30 seconds and then relax again for 30 seconds and then again back up. You should rise very gently and slowly, so you don't scare off your fellow public transportation souls. In another exercise you can hold the vertical bar with one hand in the height of your buttock, keep your arm straight, but this time behind your back while standing on one foot. Or if you feel up to it, stand on one foot and grab the bar above you while keeping balance with your shoulder and your core. Just make sure you don't loose your balance and take down half the people standing in the aisle with you :). If you really need to sit down or for you car lovers, the above exercises are obviously not possible as you need to be standing up, however, you can work on strengthening your core through your stomach. Contract your stomach muscles for 30 seconds and relax for 30 seconds. Another exercise you can do, depending on how skilled of a driver you are (at your own caution here), is stick your arms through the steering wheel, keep them streight and push to the sides like you'd be trying to rip the steering wheel apart. Hold this position for 30 seconds and then relax for 30 seconds. (don't break your steering wheel though :)). I hope the above tips were useful and next time you are on your way to the 9-9 work place, why not be more efficient. (note: I am not suggesting that working so much is good, but if you are really not keen on switching your life priorities, the above tips could just be a bandaid to your problem). I've been battling with gaining my equilibrium in life for a while now, but I think I am getting better. It is not perfect yet and probably never will be, but it has improved. I have now much more time to do things that I enjoy (like writing this swimming blog) rather than work all the time :). If you think that I am nuts, then at least think about taking some time out from your best friend, "the computer" and go for a swim. It made me smile as I pictured myself doing stealthy exercises in public transportation. Alas the days where used public transportation are long gone. Also thanks to remind me that I need to do something about the 1 1/2 hours I spent each day in my car and that I need to do something about it. Wow, this is great. Not a swimmer, but I need to work on my core and I always take the bus! Thanks for the tips!